Home Inspection is an important part of home-selling process. Even if the offer has been made, a negative home inspection report might lead to cancellation of the deal. Home owners always feel a bit tensed when a home inspector goes through their house making particular note of the things that are wrong or faulty. However, there are ways through which negative comments can be reduced in a home inspection report. A kitchen is one of the most important places in the house and inspection of the kitchen includes electrical, built-in appliances and plumbing. A professional home inspector checks out everything like bottom of the sink, inside of the appliances like dishwater, stoves and even cupboards. Apart from that the electrical panels hiding behind the cupboards are also checked. A good home cleaning regime ensures that your house stays in a clean and tidy condition without the need to worry too much about home inspection. Sometimes areas to be inspected in the house get blocked by certain items but the home inspector is neither advised nor required to move those items. Apart from that component or systems that are shut down because of certain reasons are not required to be operated. This is mainly done because of the fact that the home inspector is totally unaware of why certain systems or appliances are shut down and reactivating them might put the entire house at risk. On the other hand if the home inspector is not able to access certain areas it could lead to an incomplete report which might affect the deal. Thus, to make sure that the inspection takes place in smooth manner a thorough home cleaning is required. Before getting the home inspected, the owner of the house should make sure that every utility in the house is powered on. The home cleaning task should include removal of garbage, cleaning of materials and supplies from the sink’s bottom. Items that are hanging or kept in front of electrical panels should be removed. Cleaning everything in the house is extremely important as a dirty house gives the impression of a house poorly maintained. In case of a fireplace or wood stove, professional cleaners should be hired to clean them thoroughly. If there are any repairs to be made in the kitchen it should be carried out as soon as possible. The dirty dishes in the kitchen should be washed and put away. Every item from inside the stove should be removed and the countertop should be cleaned and de-cluttered. It is always advisable to include all these things in the list of home cleaning. This will make sure that the home inspector is able to provide a complete report that will lead to faster closing. Another important thing to consider is to provide a nice and safe place for every pet in the house. A sturdy kennel in the house or taking the pet to some relative’s place is both good options. Although this might not fall under home cleaning but surely carries a lot of importance. Cleanliness is a mark of how civilised a society or a person is. No other known creature requires cleaning everything related to it than human beings. As the cleaning techniques vary for different objects and rooms so they vary for different seasons too. However, the variation is in the details of cleaning techniques but the fundamental steps remain almost the same. Some techniques are mentioned here that may prove helpful for many in their cleaning responsibilities. These techniques cover cleaning of nearly all the common articles or rooms involved in home cleaning. Bathroom is one of those places that cannot be missed during house cleaning. In fact, bathrooms require more cleaning than any other room in the house. Development of mould is the most common issue with bathrooms or toilets. It can be removed by using any good quality mildew solution. Simply spraying the solution on the grout and then scrubbing with a brush would be sufficient to clean bathroom walls and floor. The effort can be repeated after 15 minutes, if required. Wiping the floor, walls and glass with a squeegee after shower can be adopted as a preventive measure. Windows, blinds and drapes require regular cleaning too as they remain in the open all the time. Window cleaning is done best on a cloudy day. Micro fibres are the best option for cleaning windows. Using a window cleaning on the panes and rinsing them with microfibers would surely remove all the dirt and stains. Afterwards, squeegee should be used to wipe the window pane. A regular drycleaner that is used for home cleaning can be used to clean drapes and blinds to. The only specification is that brush attachment is to be used for blinds while upholstery attachment for drapes. Simple dusting should be enough in case of moderately dusty drapes or blinds. Vacuum cleaners are to be used to clean upholsteries and furniture too. Since home cleaning is most commonly done with vacuum cleaners, the instructions about what attachments are to be used for what kind of objects is generally found on the cleaners manuals. Kitchen cupboard are another regularly used items and hence, get dirty quickly too. Cupboards simply have to be scrubbed or rinsed by microfiber cloth or scrubber sponge after getting slightly soaked in a furniture cleaning solutions. All these objects may get dirty quickly but to clean them does not require any extraordinary talent. 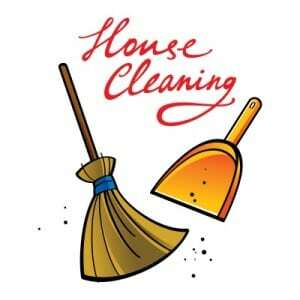 However, these have to be cleaned regularly irrespective of whether entire house cleaning is carried out or not. Computers and electronics, however, have to be cleaned with caution. It is important to switch off the appliance before cleaning. The computer or electronics attachment should be used to vacuum clean and blow off the dust. Then the parts that can be unscrewed such as mouse, cabinet, etc. have to unscrewed and wiped gently with cotton or soft cloth to remove sticky dusts. Once it is ensured that all the reachable dusts are off, the lids should be screwed again. And with it, most of the house cleaning is complete. For deeper cleaning, professionals’ assistance is strongly recommendable.